Creco wines come from the classical and traditional area around Tufo. This wine is Medium bodied with soft apricot and pear flavours with a lovely, fresh acidity. Wine of Italy. 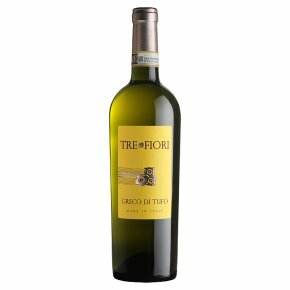 Tre Fiori is a crisp and refreshing wine produced using exclusively Greco grapes grown around the tiny town of Tufo, in the Campania region of southern Italy. It has a fragrant aroma of garden herbs and clean flavors of exotic fruit combined with a mouth-watering mineral finish. The lovely complexity makes this elegant wine ideal on its own as an aperitif. It is also a perfect accompaniment to seafood pasta and grilled tuna steak.